I am trying to throw together a last minute effort to make it to the tournament, but I'm a little concerned about cost. The tournament is really inconvenient this season with Portland possibly playing Thursday, Saturday, Monday, and Tuesday. Anyway, I was curious if anyone had suggestions on places to stay/any ideas on cheap lodging options. I don't think I'm going to go this year, but I do have some thoughts. It's likely going to be too late to stay at the Orleans, which is my preferred place to stay. Since you mentioned cost, I'd suggest staying at the Gold Coast. It's a sister property to the Orleans. There is a shuttle to and from the Orleans, so that will cut down on cab costs. DTLegend wrote: The tournament is really inconvenient this season with Portland possibly playing Thursday, Saturday, Monday, and Tuesday. Maybe give it 10 days or so - after the USD game I think we'll have a pretty good idea about whether or not the Pilots will start the tournament on Thursday or Saturday. Three wins in the next three games - certainly an achievable goal for this team - would essentially clinch at least a top-six finish and a Saturday start, and knock a couple nights off the hotel for you. Would love to make the trip out one of these years myself, but with a little Deaner on the way kind of tough to justify spending the $$$ on a Vegas trip. Especially since Vegas trips can go sideways in a hurry. Like Blacksheep said, the Gold Coast is a good option, as they are relatively close and there are free shuttles that run between them... you can go ahead and make a reservation there and cancel it later if something opens up at the Orleans. The Palms is also close, and both are within about 1-1.5 mile walking distance (if the weather cooperates and you need some fresh air). I have never stayed at either of these places, but have had friends stay the Gold Coast for the tourney, and they said it was fine and similar to the Orleans. Staying anywhere else pretty much requires cab fare/driving to the Orleans Arena, so it depends on what you want to spend. I find the Vegas.com website a good place to start to compare rates. The UP Alumni office has historically hosted events for all Pilot fans over the weekend at The Bellagio, and I know folks who stay at The Flamingo to be close to those events but at a much more reasonable cost. I’ve heard that some don’t spend a lot of time in hotels and motels, but instead take advantage of the free limo service to the Spearmint Rhino Gentleman’s Club. There’s a bit of a cover charge, but if you’re a regular they’ll waive the fee….and it’s only 3.5 miles from the Orleans Arena. And best of all, with the encouragement of their boss, many of the entertainers at the Rhino are paying for their college education with their earnings at the club......without all the silly NCAA rules. DoubleDipper wrote: I’ve heard that some don’t spend a lot of time in hotels and motels, but instead take advantage of the free limo service to the Spearmint Rhino Gentleman’s Club. There’s a bit of a cover charge, but if you’re a regular they’ll waive the fee….and it’s only 3.5 miles from the Orleans Arena. Wait, didn't I see they just opened a Spearmint Rhino in Portland? Well, if Geg Anthony can sell T-shirts and cars, I don't see why not. But the Grand Opening is apparently the 20th. So DT, first off, I've got nothing against the Gentlemen's Club. I appreciate the irony of the name and heard they were going to name one of their limos "The Dipper." For the last few years, we book our first couple nights at the Orleans early and nothing more. When we get to Vegas, we go to the discount hotel websites and look for a nice hotel at a low cost. For the last two years, we stayed at one a couple blocks off the strip that normally goes for something like $80 to $200 a night (weekday/weekend) We got it for $25 a night two years ago and $34 a night last year. You could play with the approach on-line now to see if you can find something near the Orleans. I ended up getting a room at the Las Vegas Hotel. It's pretty far away, but I can use a combination of the monorail/shuttle to get to the orleans, so we'll see how that goes. Also, I hope this isn't creepy but I have an extra bed if anyone is looking for a last minute trip, we could go halfsies on the hotel room. Finally, if anyone knows of any pregame/postgame events that would be awesome. DTLegend wrote: Finally, if anyone knows of any pregame/postgame events that would be awesome. You can expect a pregame function for Pilots' fans at the Orleans prior to each men's and women's game....details later. Post game.....you're on your own. What? You mean you don't have development folks holding the door for your limo? FYI, I just called The Orleans; even though their website shows them as sold out, they do have some rooms available... give them a call if you still need a room! 1-800-675-3267. As expected, the Pilots will take on the LMU Lions at 6 PM on Thursday in Las Vegas. The winner of the game will face BYU on Saturday at noon. Both games will be streamed on W.tv and will be telecast on BYUtv. (Perspective: last year the Pilots beat the Lions twice during the regular season, but lost to LMU at the Orleans, 65-54). Correction: the winner of UP vs. LMU plays BYU at 2:00pm on Saturday. PilotNut wrote: Correction: the winner of UP vs. LMU plays BYU at 2:00pm on Saturday. I think those are fair, although there are some who have stated that Thomas van der Mars should be in the mix. Quick look at WCC end-of-years stats and 3 jump out. Jr Van der mars 1st in FG%. In A/TO, FR Wintering 2nd and So Pressley 3rd. The U has confirmed that there will be official watch parties at the Lloyd Center Buffalo Wild Wings (1200 NE Broadway) for all UP men's games during the WCC tournament! PilotNut wrote: The U has confirmed that there will be official watch parties at the Lloyd Center Buffalo Wild Wings (1200 NE Broadway) for all UP men's games during the WCC tournament! Since neither one of us will actually be in Vegas, can I collect my bucket of beer at BWW? Congrats, B.S.! Oops, I mean BlackSheep. I look forward to delivering your prize in 2014 in Vegas... just remember the may be a hefty beer tax on said bucket of beers! And, as you may recall, PilotNut still owes a bucket to pilotfan4life from the 2012 Tournament.....and she IS now at least 21 years-old! PilotNut wrote: Thank you, Blacksheep! After "technical difficulties" of my own in getting to Vegas this year, I will again offer the prize of an Orleans bucket o' beer to the winner at the 2014 WCC Tournament in Vegas. This prize must be redeemed in person. (The winner may negotiate an alternate prize, should beers not be appropriate). So clearly, BS needs to either pull a last minute Vegas run or collect next year! And DD, didn't I deputize you to purchase Pilotfan4Life an alternate prize last year?! So, I will let the prizes roll to next year. BS, you are on for Vegas 2015. PilotFan4Life... are you going this year? 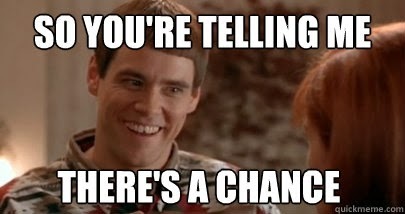 Pilots with a 2.7% chance of a tournament championship, 9.7% chance of making it to the finals, and a 20.4% chance of making it past BYU into the semifinals. I love that Pomeroy recognizes the increased opportunities for "bid thievery" with the change in format this year. From Jim Beseda: It's usually madness for college basketball teams to reinvent themselves in March, but the Portland Pilots haven't had a choice.